Chemical peels may be the single best procedure, bar none, to achieve facial rejuvenation in many patients. Unlike traditional surgeries, there are no incisions and therefore, there are NO scars. But the results that can be achieved are often quite remarkable. Also, chemical peels may be substantially less costly than traditional surgery. Men and women alike share a common desire to have healthy, youthful skin. But, no sooner do we grow out of our teenage skin problems, than we begin the next phases of skin irregularities caused by sun exposure, smoking, gravity, hormones, and heredity. Chemical peels have become very popular with those who are unhappy with acne scarring, sun damaged skin, age spots, freckles, fine lines, rough skin, and uneven pigmentation. Chemical peels are not limited to the face and can be performed on the neck, chest, hands, arms, shoulders, and legs just about anywhere! For centuries, people have sought smoother, more beautiful skin and have used crude types of chemical peels to achieve the effect. Today, new techniques and technologies in chemical peeling offer safe and effective ways to improve the texture of the skin. Chemical peeling is a process whereby a chemical solution is applied to the surface of the skin to peel away the top cell layers which will be replaced during the healing process with a fresh, new skin surface. Most Patients notice an improvement in their skin’s appearance. Fine lines and age spots are erased. Acne scars, blotchy and uneven pigmentation, freckling, sun damaged skin and stretch marks are improved in just a short period of time. Chemical peels may be classified as superficial, medium, and deep. Superficial peels are ideal for active patients who cannot afford to take time off for healing but who want an improvement in their skin appearance. Deeper peels may require 1 to 2 weeks to recover but produce the most dramatic results. There are all kinds of chemical peels. Chemical peels vary by the agent used and the depth achieved. Lighter peels can be done painlessly in the office. Deeper peels, although also often done in the office, may require anesthesia or may be done in the operating room but the results can be outstanding. Dr. Kass is an expert in chemical peeling. 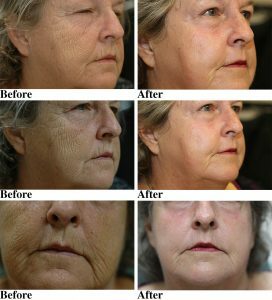 One of the earliest physicians to adapt the groundbreaking Hetter peels after they were first described in 2000, Dr. Kass and his staff would be happy to show you the kinds of results which may be achieved with this revolutionary technique in facial rejuvenation. These peels can be combined with cosmetic eye (eyelid) surgery (blepharoplasty), eyebrow or forehead lifts, or with procedures on the lower face such as a midface lift, S lift, or lower facelift to achieve the best possible results for you. If you are considering facial rejuvenation, consult an expert in facial plastic surgery. Dr. Kass has performed chemical peels on so many satisfied patients during his successful career, why trust your face to anyone else?